According to the dictionary, “Stagecraft” means: “the effective management of theatrical devices or techniques”. True that. 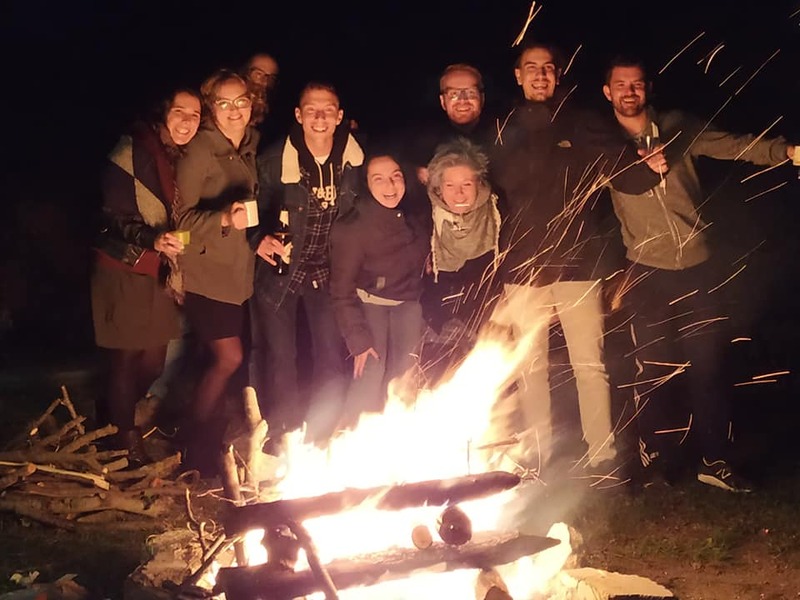 Since november 2018, however, it is also the name of an Erasmus+ training course we organized in Sermugnano, Italy. 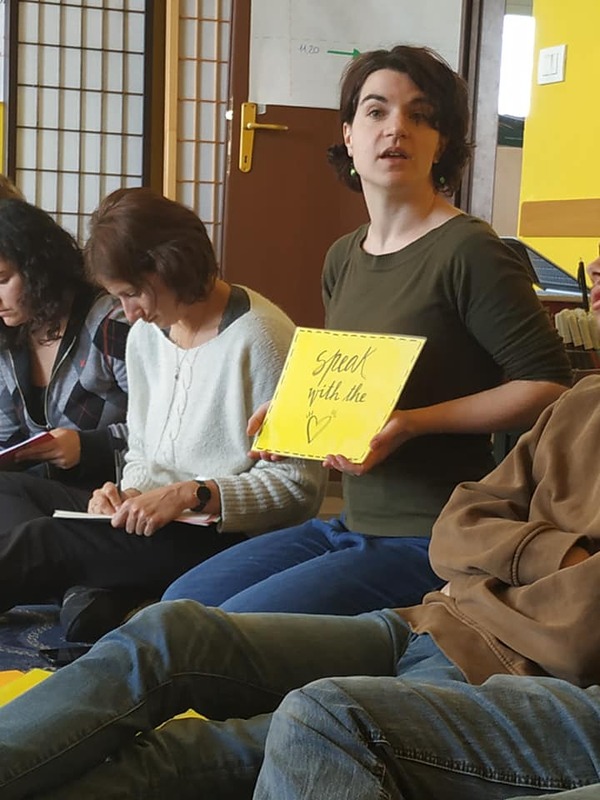 Our aim was to support youth workers and educators in their work, by becoming more effective and engaging and developing speaking, communication and interpersonal skills. Did we manage? I think so. To find out how, you just have to read below. The story begins in one of the coldest weeks in February 2018. We were in the middle of Czech Republic, near Olomouc, for a training course. Mafalda got struck by a bronchitis but she heroically couldn’t stop writing. There was this amazing idea for a new training course. 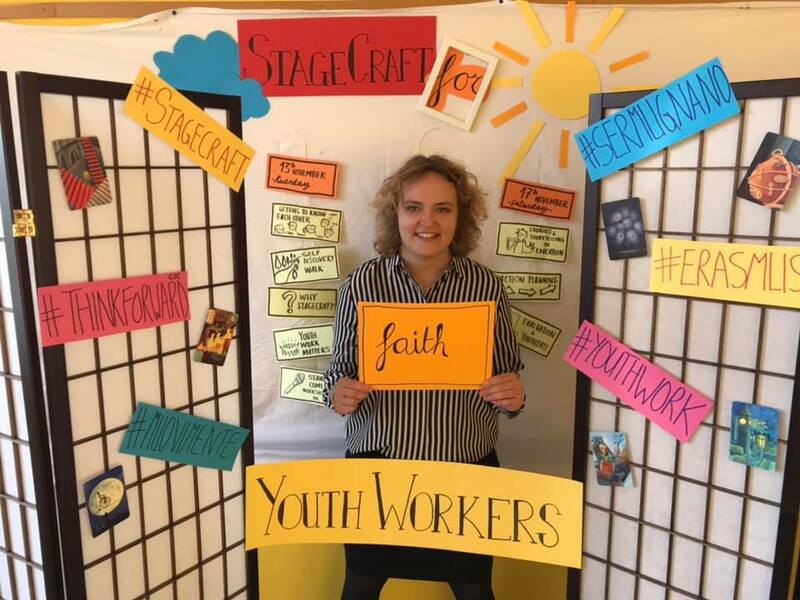 One that could combine presentation skills, voice and body, theatrical techniques, comedy and humor to empower youth workers. She had to manage the submission within the deadline! And so, even with terrible coughing and sneezing, she soldiered on filling in one after another all the sections of the online application form. Fast forward to a couple of months later: we got the green light, the idea was funded! Mafalda’s dedication and sacrifice were rewarded, and we knew that vision would soon become real. If this isn’t a story that hard work and motivation bring to satisfaction in the long term, then I don’t know what is. But also, things don’t always go so well, so don’t get too used to happy endings. The project idea was developed together with Steve Burns and Buzz Bury from Think Forward, a British organization based in Blackpool that specializes in youth work and experiential learning. Buzz looks a lot younger in the picture from the website; on the other hand, the passing of time leaves almost no trace on Steve, which is unnatural and frankly, a little bit creepy. But anyway. The program received a huge boost thanks to the professionalism and the experience of these two fantastic trainers. Together with Mafalda, the Fab Four were completed by yours truly. First of all, the location. 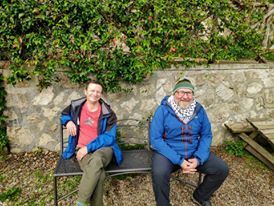 We were once again in the wonderful setting of Sermugnano. 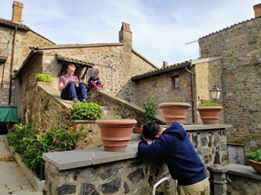 The tiny village, perched on Italian hillside between Lazio and Umbria, is a uniquely inspiring location for a training retreat. The lack of distractions, the sense of community and the close contact with nature all work together to create powerful and memorable experiences. Two very old residents of the area. For me, every time I return there feels like a home coming, and this was no exception. 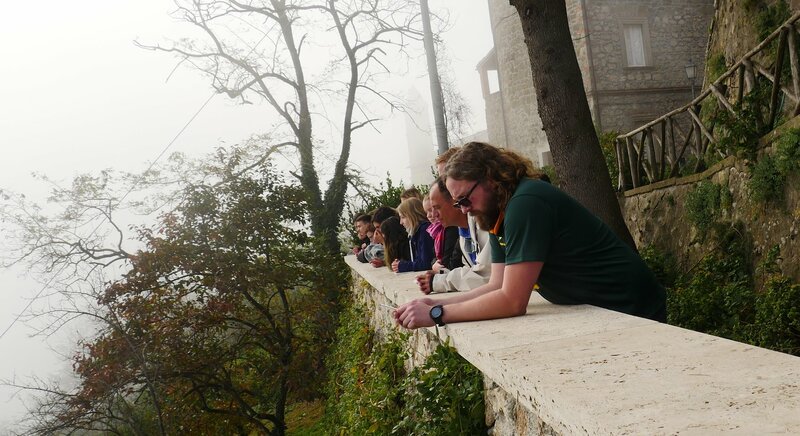 The program was encapsulated in our usual “Service and Care” routine, which included daily tasks to take care of the place, our group, and the nature around us. 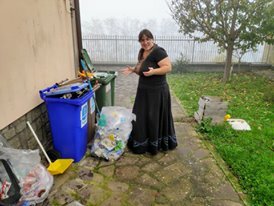 Every morning, divided in small teams we took care of recycling garbage, washing up after the meals, cleaning the indoor spaces, writing the report & taking care of administrative stuff, and promoting our project on social media. It’s one of our signature solutions when we are working with a group, and honestly, it works wonders. The teams were organized in a rotation of shifts, so that nobody had to do the same job twice, and it’s the most beautiful and calm way to start a working day. 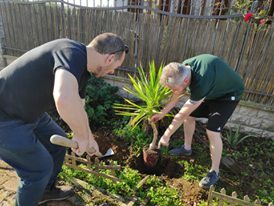 I love to take care of the outdoor spaces and the garden, tell small stories about what bush or tree was planted in which occasion, and at the same time make sure we will leave the space in the same condition as we found it, or better. That’s education to sustainability in action! Here is to the organizing team. 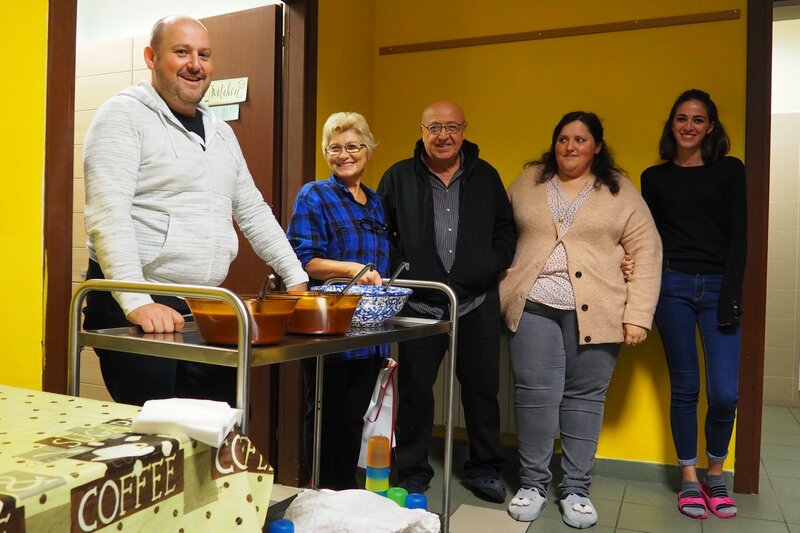 Giovanna, Angelo, Silvia, and the volunteers who helped us, Emilia and Mariam. Thank you! 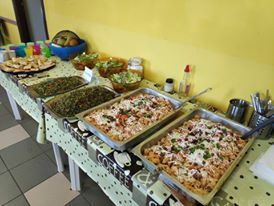 I mean, just look at the food! I have to say that it was a real pleasure to work with this group. It was such a great collective of dedicated, fun and talented people that every morning we got up and went to work with a smile on our face. True, also the (super) mild Italian Autumn weather may have had a role in that. You see? Climate change is good, after all. So, as the program unfolded, we managed to put the right gear on, the different personalities and group dynamics emerged, and working with the group became more and more pleasant. 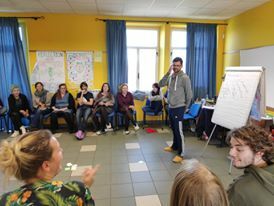 youth work context in Europe; how to structure a learning module and a reflection activity; how to present content in interactive and engaging ways; some basic tools for storytelling (based on the structure of the fairy tale), the way of council. 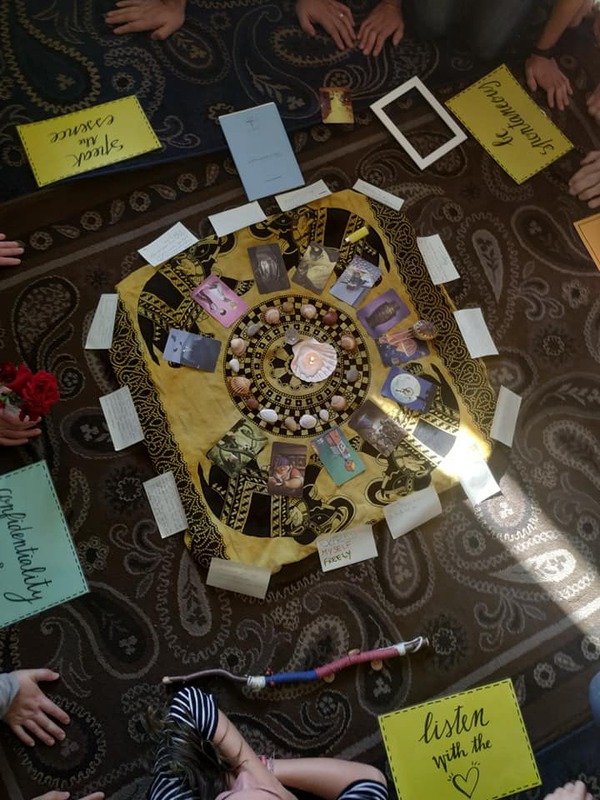 It was inspiring to see how the group responded to each challenge and input, each person defining their personal learning goals and working very actively to pursue them. In the end (even though the evaluation is still under way) it seems that they were generally very satisfied about the experience. And so were we from the training team. 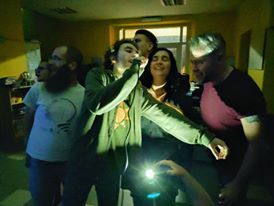 Singing was not part of the program initially, but we did have one or two (or three) karaoke nights. I am especially proud of one experiment I tried. 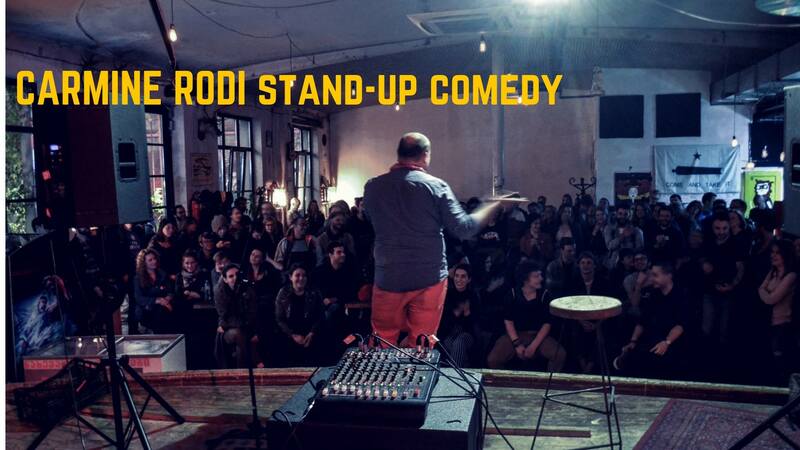 As some of you will know, dear readers, I am also active as a stand-up comedian, based in Prague. You can like my fb fan page right now, thank you very much. It’s a fantastic experience and I am learning so much through it, real hard-fact measurable competences that I am applying in my personal and professional life. So, we thought, this training course was the right place to try something crazy and new: how about incorporating a full stand-up comedy workshop into our program, ending with a “graduation show” on the final night? To be honest, it was a crazy idea. In the past year and a half, since I started stand-up, I have jumped at every opportunity to learn about comedy, from short workshops with fellow comedians, to longer comedy courses held by professionals (and beyond, including entering improv and improv musical territory whenever I could). From my profession I know very well that every little bit helps, that all learning is connected and everything comes together, sooner or later. But this time I wanted to raise the bar and challenge myself – and the group – a bit more, and trying to organize a show with a group of total beginners was a totally new challenge for me. That’s why I liked it! I was completely honest with the group, and I gathered very important feedback from them and from the experience. 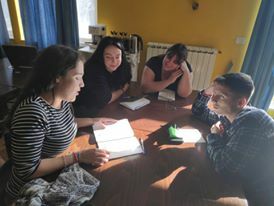 We had one first evening introductory workshop for the whole group, during which we introduced the idea, played a couple of warm up games and started to brainstorm possible ideas for comedy material. From this workshop we formed the group that would then go on and prepare the final show. We worked really hard with this “dirty dozen” (we had in fact twelve aspiring comedians) to define what a stand-up comedy set is – and what isn’t, mine potential ideas for comedy from everyday life and situations, exercise writing and delivery. Time was so limited! 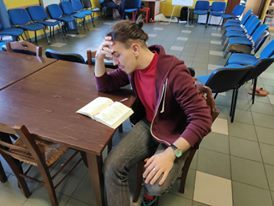 We had one evening group rehearsal – we definitely needed two, AT LEAST – and even then we went really over time. The brave artists gave everything they had working with their peer groups, writing one draft after another, using every spare moment in an already very intensive program to refine their material. It was inspiring, and also amusing at the same time. I know what it means to have that familiar “comedy bug”, when everything you see and think seems to hold so much potential for jokes – except most of the time, it doesn’t, and the only way to find out is to go out and try it in front of a live audience. It’s risky, unforgiving, addictive, terribly rewarding. It was very interesting to see how some of them were definitely sick of the same disease! Together with this crazy band of brave souls we embarked in such a course-within-the-course, and in the end we had a show ready. 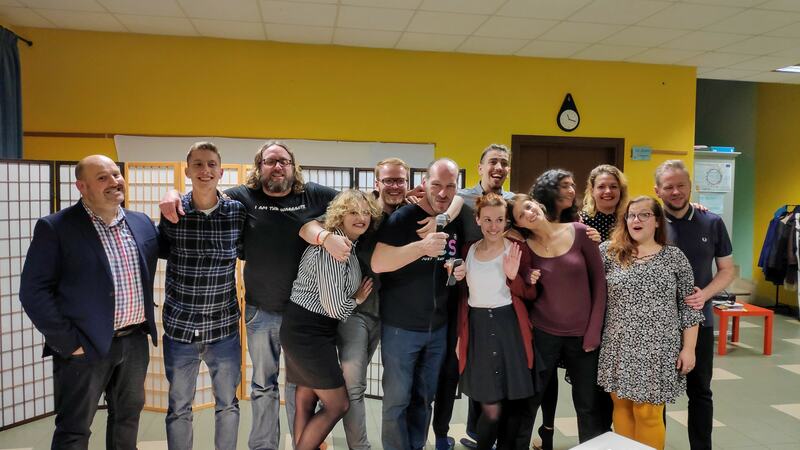 “The Dirty Dozen – Sermugnano edition” was ready to go live, and we had almost two hours and a half of live comedy show! Sure, not everything went according to the plan and not everything was perfect. But is it, ever? That’s the story of everything in live entertainment, every time. Besides, that’s how we learn, and a training course was the perfect safe space where to experiment with these things in a controlled environment. On the other hand, we know we managed an impressive feat, put together a show entirely from scratch – and for many people, it was a real debut on the scene. Plus, we genuinely had so much fun in the process! 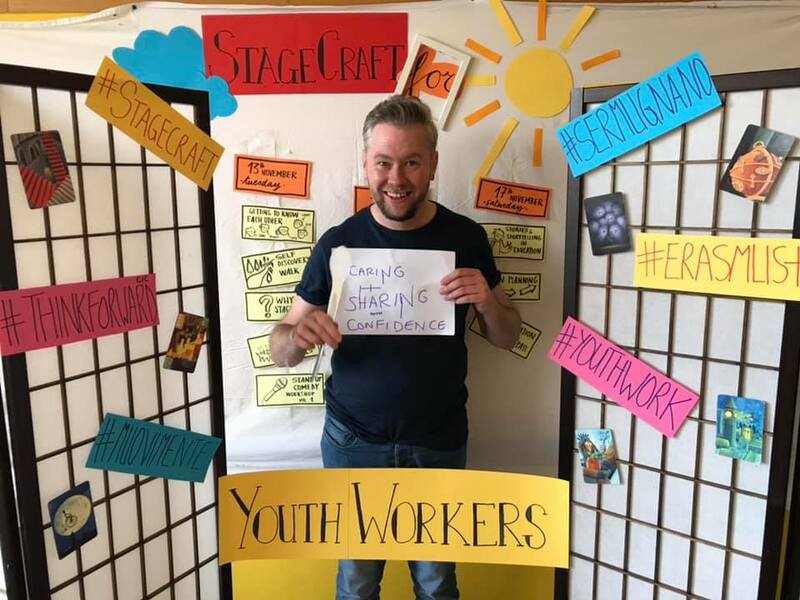 All this was Stagecraft: presentation, communication, engagement, youth work theory and practice, lots of sharing, community life, sustainability, humor, fun, showtime. And a special ingredient: “tanto amore”. We are looking forward to doing it again from the beginning, definitely. Ok, maybe without the bronchitis. Thank you for reading this, you can learn more about the course by following its social platforms (come on, do it! it’s free) and if you or your organization would like to get involved, host or co-organize a follow up for the course, by all means let us know! We will be delighted to support you.